You have a lot of options you can use to make money. But investing in the stock market is among the best that one can think of. By buying shares, you can double, triple, or even increase your investment by 10 times. It all comes down to how you play you cards. If you invest in the right companies, you will just sit at home while your money works for you. However, investing is not without risks. In this book, you will learn how to make money buying stock. Although this is not easy, it is not as hard as you may think. 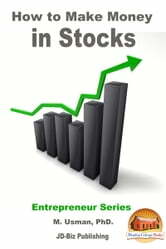 The book will start with an introduction to stocks and how you can make money with them. We will then move on to look at how much you need to get started; many mistakenly think they have to be filthy rich. Profiting from your investment comes down to the strategies you use. If you follow the wrong ones, you will likely fail to achieve your goals. And in the worst cases, you may even lose your money. The book has a chapter dedicated to investing strategies. With so many companies you can invest in, you may not know which ones are the best. But fear not as you will also find another chapter dedicated to analyzing companies. In addition to all that, you will find other tips to increase your understanding on this subject. You will surely find the book helpful. Portfolio Performance Measurement and Benchmarking, Chapter 1 - What Is Performance and Benchmarking? How to Find a Good Penny Stock In Less Than a Minute? Why Are Earnings Announcements So Important to Traders and Investors?